Casino Hold’em uses the same consept as in Texas Hold’em, but here the player has the opportunity to play against the casino! Casino Hold’em – beat the casino! The game is done with an ordinary 52 stack without any joker. You have the opportunity to place a bet on the possibility that you will get a pair of ace or better in the hand you are dealt. If you get so, you win a special bonus after the first round. The dealer deals two cards to each player and two to himself. In addition three community cards are dealt face up in the middle of the table. This is “The Flop” and it contains 5 cards. The players continues either by betting or folding. If a player folds, he loose his bets and the eventually bonus. 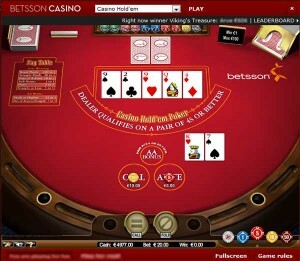 If the player wish to continue the player puts a bet on “call” and the game keeps on. Call is always the double of “ante”. The dealer will now add two more community cards, these are called ”The Turn” and ”The River”, and finally shows his hand. The dealer must then compare his hand with the player. The dealer must have a pair of four in order to qualify. If the dealer doesn’t qualify the player keeps his and his call bet and wins with his ante compared to the payout table. If the dealer qualifies and the dealer and the player has the same hand it is “push” (drawn) and the player gets his ante and call back. If the dealer got a better hand, the player loose. If the player wins he keeps his ante and call-bet and wins ante compared to the payout-table and call, which pays 1:1. The payout for the ante-bet is highest when the player got Royal Flush. This is paid 100:1. Straight or lower is 1:1.